During the Cold War the Canadian north took on strategic importance as North America’s first line of defence. Front and centre in the plan to defend the north were the No. 7 Company Canadian Rangers. This Company was formed after the Second World War with their headquarters in Yellowknife (map) and platoons in Fort Smith, Hay River, Coppermine and at at Port Radium on Great Bear Lake. In 1951 the military appointed John Anderson-Thomson as the Commanding Officer of No. 7 Company Canadian Rangers and it was his job to ensure that men with both fighting experience and knowledge of the north manned the Rangers. Anderson-Thomson had served in both the First and Second World Wars as a commissioned officer. As a surveyor and geologist working out of Yellowknife he was very familiar with the north and what it would take to defend it. Anderson-Thomson’s first move as the commanding officer of the Northern Rangers was to get rid of all those men he felt wouldn’t be able to stand up well in a fight. The men he did keep were the army veterans, in particular the machine gunners and infantrymen, along with anyone with trapping or prospecting experience. He figured these men would not only be tough but would be the first to notice any unusual enemy activity out in the bush. The Defence Department was concerned about the situation in the north and came up with a plan to test northern defences in a series of military operations they called “Bulldog”. In the fall of 1954 John Anderson-Thomson was ordered to prepare his Rangers for “Operation Bulldog III”, a mock invasion of Yellowknife by the “enemy”, the 1 st Battalion Royal 22 nd Regiment, the famous “Van Doos”. Anderson-Thomson was to coordinate his Rangers, the 24 th Field Squadron of the Royal Canadian Engineers and a Company of Army Cadets – a total of 65 men armed with old British 303 Lee Enfield rifles and a dozen light machine guns – to “fight a delaying action” in defence of Yellowknife. These delaying tactics were to give time for a unit of the Princess Patricia’s Canadian Light Infantry to fly in from the south and save Yellowknife. Anderson-Thomson was only told of the approximate date of the invasion and when it came, at precisely 15:30 on Friday, February 25 th, the weather, at -40ºC, was perfect for an arctic military exercise. The commander of the Van Doos had been ordered to secure the airport and to capture stocks of aviation fuel on Jolliffe Island. Mock battles were fought with the Rangers but the Van Doos failed to break out of the cleverly planned defensive perimeter surrounding the airport. When the Princess Pats arrived the next day they parachuted onto Yellowknife Bay “without interference by the enemy”, an enemy that had been soundly defeated by a ragtag company of bush-wise northerners. Timeline Link: 1946 Operation Muskox . 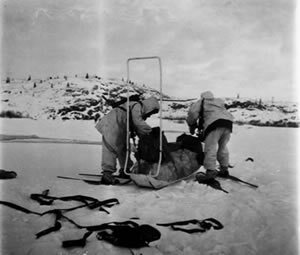 Soldiers air-dropped on lake at Yellowknife check gear on sled.